Maybe if someone instructed me *not* to follow the pattern I would be able to do it? I’d seen this cardigan: Drapey Neck Silky Tweed Cardigan by Heidi Kirrmaier (available for free on Ravelry) and decided to knit it as my Tour de France jersey. White jersey. 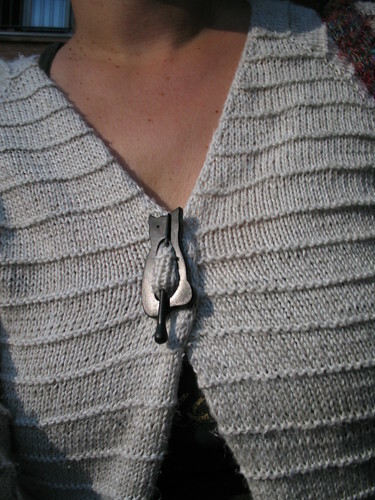 I cast on and stumbled upon another picture of a lovely cardigan and immediately modified the pattern accordingly. I even found the perfect brooch today (it matches one of my cats) and I am so pleased with my inability to follow a pattern! I now have a perfect over-a-summer-dress cardigan. 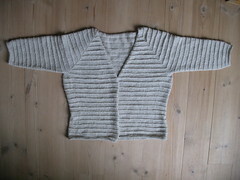 If you’re on Ravelry, please check out Heidi’s pattern. 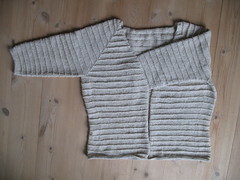 This entry was posted in Enthusiasms and tagged cardigan, Inspiration, Pattern, TdF. Bookmark the permalink. I like it very much. The neck edging is very neat. Did you go round and pick up and cast off, or did you slip one at the beginning of each row? Have been doing very much the same thing with a red top-down spring/autumn cardigan which you have inspired me to get photographed and online. Thank you!